You will need Node and npm installed on your machine. A basic knowledge of Ionic development will be helpful. Over the past few years, advances in machine learning, especially natural language processing (NLP), have made it easy for computers to analyze and derive meaning from human language in a smart way. With this, developers can now create smaller, simpler and more intuitive natural language processing software. 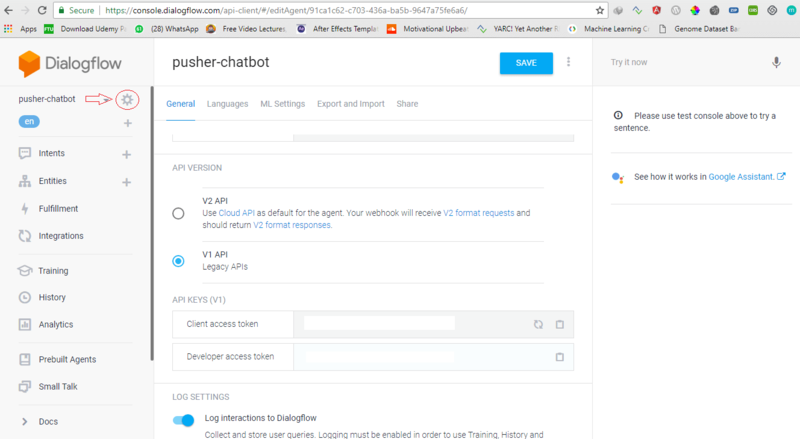 In this tutorial, we’ll demonstrate how to build a chatbot using Pusher with an Ionic application and also using the Dialogflow conversation platform formerly know as api.ai by Google. This bot will engage in simple conversations. We will send our message to our server and Dialogflow, with the help of Pusher we will update our chat conversation in realtime. To make use of Pusher, you’ll have to create an account here. Let’s build! To follow this tutorial a basic understanding of Angular, Ionic and Node.js is required. Please ensure that you have Node and npm installed before you begin. If you have no prior knowledge of Ionic, kindly follow the tutorial here. Come back and finish the tutorial when you’re done. To get started, we will use the CLI (command line interface) provided by the Ionic team to initialize our project. First, install the CLI by running npm install -g ionic cordova. NPM is a package manager used for installing packages. It will be available on your PC if you have Node installed. The command is merely telling the CLI to create a new app called chatbotApp and it should make use of the blank starter template. While the setup is running you might get a prompt "Would you like to integrate your new app with Cordova to target native iOS and Android?". If you want to start running or testing the application on a mobile device or emulator as you build, then choose yes by typing Y and pressing Enter on your keyboard, else type N and continue. You might get another prompt "If you would like to integrate ionic pro ?" , we wouldn’t be needing that in this tutorial so just type N and if you would like to extend the project into production with your team choose Y. Automatically your default browser should open, and you should see the screenshot below if everything went well. First, we initialize Pusher in the constructor. The getPusher() method returns the Pusher property we created. Ensure you replace the PUSHER_KEY and CLUSTER string with your actual Pusher key and cluster from Pusher. Let’s update our chat-service provider for sending messages to our bot and connect to Pusher’s channel. sendMessage(): this method takes in our inputted message and sends it to the server. getChannel(): is returning our Pusher channel so we can easily subscribe to any message coming from chat-bot channel. Let’s add the chat-service provider and HttpclientModule for HTTP requests to the app.module.ts. FormsModule is going to be used later in building our chat input form. For the above template, we are making use of the *ngFor directive to loop through our chats and display them based on the type of message. bot: here we are using the *ngIf directive to check if the message sent is from the bot, then it uses the message received class which we would create soon. isMe: this checks if it was the user that sent the message. From the above code, we subscribed to our Pusher channel for chat-bot when the page is being called by Ionic (ionViewDidLoad). We also checked if the type of message coming in from Pusher isn’t from the bot. We used the sendMessage method to send messages to our server and toggling a variable called sending to notify our template to show what is going on to the users. Then we reset the message to an empty string to clear the message input field on our home.html. This is because the chat-service provider url doesn’t exist yet. Let’s set up our server. 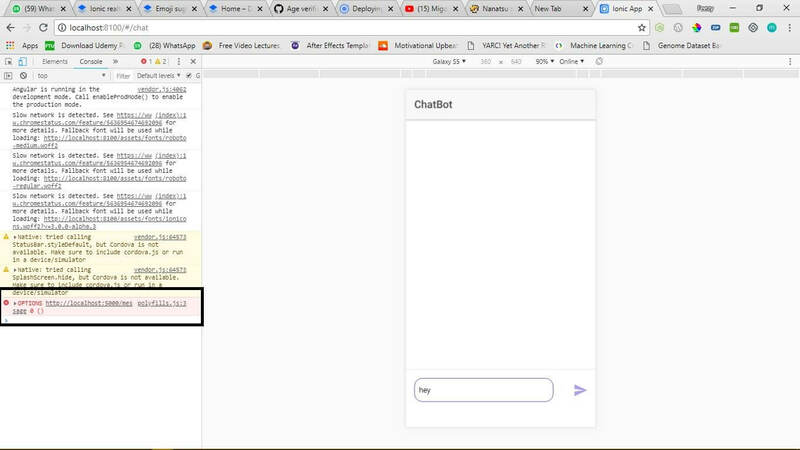 We have created an API /message, which sends a message to our bot which we will configure soon by triggering an event with Pusher so our chat can receive the message. You can get your own .env config within your Pusher’s channel application dashboard. Navigate to the Getting Started tab, under Add this to your server column, select .env to copy, then paste in your .env file. Click on the icon within the red circle to view our agent settings where we can locate our API keys. Open our .env and add our client access token, not the developer token, as our use case we are going to be doing more of querying of our chatbot via APIs. Read more. What we have done is to update the POST /message endpoint to handle any message sent from our Ionic application, then the server then sends the message to Dialogflow through our utility function. Dialogflow returns a response containing what our bot processed from the message. Then we triggered Pusher’s event to send a message to our user using the response from Dialogflow. 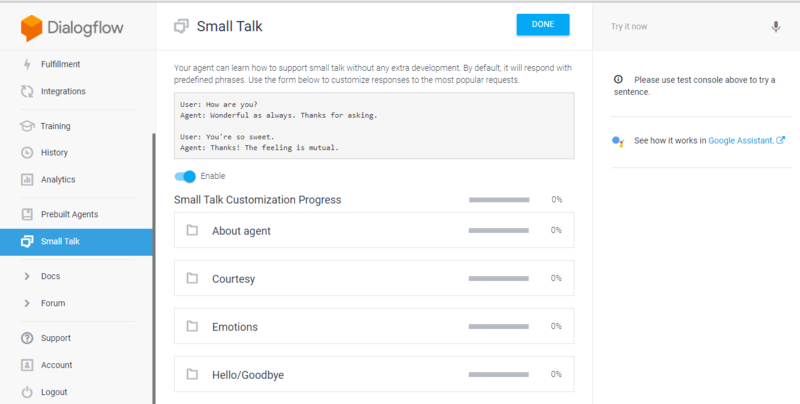 Here, we have been able to build a chat application that connects the user to a chatbot on Dialogflow. The intention was to give you a general building block that can be built on, explored, and improved to build an amazing chatbot. The source code for this tutorial can be found on GitHub. Feel free to explore and add more features.